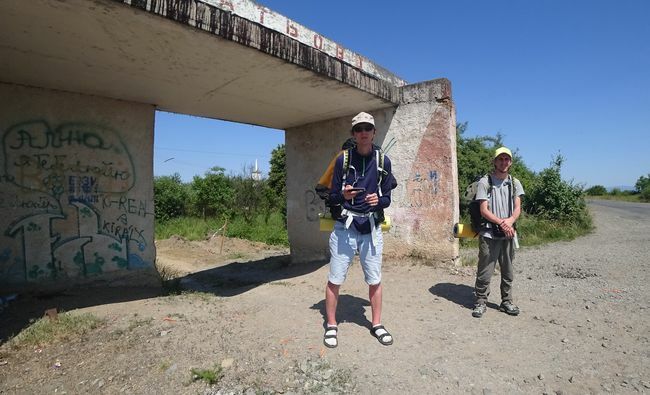 An independent theatrical person Sashko Brama, and the actor and photographer Andrii Buchko have decided to walk across this country from the extreme western point Chop to the Donbas disengagement line. They want to find answers to the simple and, at the same time, difficult questions: what in fact makes the life of people in big cities and small villages, what do they think of Ukraine and their compatriots in other regions? What do they have in common and in what ways are they different? The guys told The Day about the expectations from the travel and its real conditions as well as shared their impressions of what they saw and heard in some western regions. How did you hit upon the idea of this travel? Why did you name the project Enter UA? Sashko BRAMA: “Everyone perhaps wishes to travel, and we are no exception. I suggested to Andrii, with whom I had worked on several projects before, that we combine artistic work and traveling. It’s good that he supported me, for I wouldn’t have set out on this journey single-handed. So, we began last fall to frame a concept, think about the route and money, and psych ourselves up for the trek. Why did you choose to walk? How did you form the expedition’s itinerary? Andrii BUCHKO: “We had read stories of the people who travel and hitchhike and watched a lot of Youtube clips. But we understood after the first day that our idea of this travel was wrong and that it would be more difficult than we had thought. What do you pay attention to during a journey? S.B. : “The main thing is to be as much open to the environment as possible, for the latter is supposed to dictate a dramatic concept on us. Making a documentary always means cooperation between the author and reality, so the result depends not only on us. “Every region has some burning problems that we come across. So the list of themes is drawn up in the course of the hike. Then we will filter the gathered material and formulate the overall dramatic concept. Politics is of no interest to us in this travel. But we will hardly escape it because the very fact that we are walking from west to east can be viewed as a political action. What surprises have you already come across on your way? S.B. : “We sometimes joke that if we were to write a play and think up a unique day, we wouldn’t invent anything better than what really happens to us. What situations and meetings have stuck in your memory? S.B. : “In some areas of the Ternopil region, land is privatized by Germans or Danes but cultivated by Ukrainians. They grow rapes or other crops that exhaust the soil. We visited one of these farms and saw that there were good conditions for workers – they are provided with meals, there is a washing machine, a shower, etc., there. I don’t know if Ukrainians treat their workers as well as Germans do, but it is rather a disputable situation, and you can’t possibly draw an unambiguous conclusion here. “Very many people go to the abovementioned Tunnel of Love to have pictures taken, and a host of wedding ribbons hang there. But that tunnel also contains a strategic track on which equipment is carried to the ATO zone. We also met a soldier there. He said that when he was a small boy, he and his friends used to kill grass snakes and hang them along the tunnel. He called it a ‘tunnel of death.’ In other words, diametrically opposite things come together in this place. We saw it as an interesting metaphor. “We also met Pavlo, a 72-year-old restorer, who once restored this town hall himself. For me, he personified the existential theme of a struggle between man and the forces of entropy. Interestingly enough, the anthem of Ukraine plays upstairs, and he listens to ‘metal’ downstairs. Would you tell me more about the people you came across on your way? What do they have in common? Are there many differences between the residents of different regions? S.B. : “Every individual is like a separate country, a world apart. They are totally different people. What unites them is the passport of a Ukrainian citizen and, partly, the language. It’s very difficult to reduce them to a common denominator. Has the travel already changed anything in you? What will you advise those who will want to make the same kind of journey?